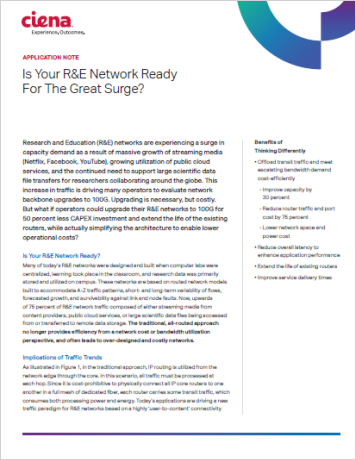 R&E networks are experiencing a surge in capacity demand as a result of massive growth of streaming media, growing utilization of public cloud services, and the continued need to support large scientific data file transfers. This increase in traffic is driving many operators to evaluate network backbone upgrades to 100G. Upgrading is necessary, but costly. But what if operators could upgrade their R&E networks to 100G for 50 percent less CAPEX investment and extend the life of the existing routers, while simplifying the architecture to enable lower operational costs?